The underlying idea for learning scaffolds is relatively old. Most people trace the concept to Lev Vygotsky's (1978) idea of the "zone of proximal development." Vygotsky believed that a learner's developmental level consisted of two parts: the "actual developmental level" and the "potential developmental level." The zone of proximal development, then, is "the distance between the actual developmental level as determined by independent problem solving and the level of potential development as determined through problem solving under adult guidance, or in collaboration with more capable peers" (p. 86). In Vygotsky's words, the zone of proximal development "awakens a variety of internal developmental processes that are able to operate only when the child is interacting with people in his environment" (p. 90). The zone of proximal development can also be described as the difference between what a learner can do independently and what can be accomplished with the help of a "more knowledgeable other." This concept is critical for understanding how to scaffold learning. The more knowledgeable other, who can be an adult or a peer, shares knowledge with the learner to bridge the gap between what is known and what is not known. When the learner has expanded her knowledge, the actual developmental level has been increased and the zone of proximal development has shifted upward. In other words, the zone of proximal development is ever changing as the learner validates and extends knowledge. This process is what led Vygotsky to write: "Through others, we become ourselves" (Rieber, 1998, p. 170). But Vygotsky did not use the term scaffold or scaffolding. The term scaffold, as applied to learning situations, comes from Wood, Bruner, and Ross (1976), who define it as a process "that enables a child or novice to solve a task or achieve a goal that would be beyond his unassisted efforts" (p. 90). As they note, scaffolds require the adult's "controlling those elements of the task that are initially beyond the learner's capability, thus permitting him to concentrate upon and complete only those elements that are within his range of competence" (p. 90). For example, in teaching a child to ride a bike, the training wheels serve as one scaffold. The adult running alongside the bike serves as another. In other words, the adult handles the harder parts temporarily, while allowing the child to try out the easier parts. Dixon, Carnine, and Kameenui (1993) remind us that effective scaffolds must be "gradually dismantled" in order to remain effective (p. 100). However, if scaffolds are dismantled too quickly, learning does not occur and the learner becomes frustrated in the process. You probably have noticed that we use the term scaffold as a noun rather than a verb, because a present-tense verb may imply a process that is ongoing, which places teachers and students at risk of dependency rather than independence. All of the theorists and researchers we have focused on thus far have one important thing in common: they're trying to influence what's inside the learner's brain. That's what teachers are trying to do as well. Teachers really are brain workers. We're not suggesting that the neurosciences have all of the answers that we need to effectively teach. We acknowledge the concerns about relying too heavily on brain science (Bruer, 1997). For example, Willingham (2008) says, "I don't understand what my computer hardware is doing as I type this reply, but if I did, that knowledge would not change how I typed or what I wrote" (p. 422). But we think Willingham understands something more important about his computer hard drive—namely, the best ways to store and retrieve information. And that's our goal here. As teachers, we have to be aware of the best ways to help students store and retrieve information. We know that worksheets aren't going to do it. As has been said before, "worksheets don't grow dendrites" (Tate, 2003). We also know that simply telling students something isn't going to do it. After all, how many times have you remembered everything you heard? Thankfully, there are things we can do to ensure that students learn. At the most basic level, we have to get those things into students' working memory and then have them use those things so that they move to long-term memory. Larry Squire, a professor of psychiatry and neuroscience, and Eric Kandel, a neurobiologist and Nobel prize winner in medicine, demonstrated that there are three areas of the brain involved in the early stages of learning a new skill or procedure: the prefrontal cortex, the parietal cortex, and the cerebellum. These three areas allow the learner to pay attention, to execute the correct movements, and to sequence steps. Squire and Kandel's (2000) research, and the research of others that they summarize, suggest that as a task or procedure is learned, these three brain areas become less involved as the sensory-motor cortex takes over. In other words, more cognitive "space" is devoted to learning a new skill than executing a learned skill. This is one place where instructional scaffolds help. The teacher can provide temporary support for students as they use more space to learn something and remove that support when they have learned it. Hebb (1949), a psychologist who significantly influenced the field of neuropsychology, suggests that as neuronal pathways are used repeatedly, they begin to change physically and form steadily faster networks. Hebb's principle, "neurons that fire together, wire together," is echoed in the theory of automaticity (LaBerge & Samuels, 1974). As these pathways are used with ever-increasing efficiency, the skills become more automatic, creating the necessary "think time" to form new connections. In other words, as specific tasks become automatic, working memory is available for meaning making. Automaticity is dependent on a learner's working memory. Despite attempts to cram lots of information into a brain all at once, neuroscience research confirms Miller's (1956) finding that humans can work with about seven new and previously unassociated bits of information at a time. Interestingly, this limitation is removed when information from long-term memory is moved back into working memory to complete a task (Ericsson & Kintsch, 1995). Again, this finding has important implications for teacher behaviors. We have to provide students scaffolds when they are working with new or previously unassociated information, but we do not need to provide scaffolds when students are working with known information. Teachers need to chunk information in ways that are consistent with working memory and long-term transfer. One of the ways to do this is through work with schemas, or mental structures that represent content. Tools such as concept maps, word webs, and graphic organizers provide students with schemas that they can use to organize information (Guthrie, Wigfield, & Barbosa, 2004). These are scaffolds—temporary supports—that provide students with organizational systems for learning content. But even more than that, an understanding of memory systems has profound implications for instruction, which include creating systematic and intentional scaffolds of students' understanding rather than leaving them alone to discover information independently. That's not to say that students should not work together in collaborative learning; they should. We have argued for productive group work in which students interact with one another and generate ideas to produce individual works (Frey et al., 2009). But this work must center on the consolidation and application of content that students already know. It's neither the time nor the place to introduce new information. Doing so would overload the working memory system and fail to ensure learning. Although we advocate productive group work, we do not argue for turning classrooms into places devoid of guidance from the teacher. Our experience and reviews of the research suggest that the teacher must be involved in guided instruction, using appropriate scaffolds, while students are engaged in productive group work with their peers. Scaffolds reduce the demand on working memory. As Kirschner, Sweller, and Clark (2006) note, we cannot "proceed with no reference to the characteristics of working memory, long-term memory, or the intricate relations between them" (p. 76). That does not mean that we rely only on direct instruction and simply telling students what they need to know. Rather, we need to guide students to new levels of understanding and ensure that they have a wealth of opportunities to practice and use that information so that it moves into long-term memory and can then be accessed by working memory without the constraints of the number of items that can be used (Sweller, 2003). It's been several decades since Vygotsky introduced his idea of the zone of proximal development. Like classics in literature, this idea has staying power because it speaks to a truth that we've all experienced. Having said that, it's hard to implement on a daily basis, especially when working with groups of learners. Remember that most of the early work done on zone of proximal development and instructional scaffolds was done with individual students, not small or large groups of them. Wood and Wood (1996) even note that Vygotsky's definition leaves us with the arduous task of figuring out "the nature of the guidance and the collaboration that promotes development" (p. 5). Thankfully, a number of researchers have identified components of instructional scaffolds that have helped teachers put Vygotsky's theory into operation. For example, Ragoff (1990) validated the findings from Wood and colleagues (1976), noting that with scaffolds, "adults support children's learning by structuring the task's difficulty level, jointly participating in problem solving, focusing the learner's attention to the task and motivating the learner" (cited in Rodgers, 2004/05, p. 504). In doing so, the adult implements a number of instructional contingencies, varying the type and amount of support to ensure that the student is successful. Maloch (2002) found that teacher scaffolds included "direct and indirect explanations, modeling, highlighting of strategies and reconstructive caps" (p. 108). Like those before her, Maloch found that varying support provided the teacher with information about new learning and needed intervention. The Maloch study also suggests a new type of scaffold, "reconstructive caps," in which the adult highlights the success of the student with the goal of encouraging the student to engage in that behavior or skill again. These reconstructive caps are one more scaffold that adults can use to facilitate student understanding. Rodgers (2004/05) also extends our understanding of instructional scaffolds with her study of student-teacher interactions. In addition to the teacher moves we have already noted, Rodgers's data suggest that teachers should provide students with opportunities to make errors. As Elbers (1996) notes, errors are important in the learning process because they provide "occasions for various suggestions, demonstrations, or explanations" (p. 284). Provoking or noticing these errors provides the teacher with an opportunity to prompt, cue, or explain and model. In doing so, the students and teacher pay joint attention to the task and work together to reach an understanding. We've called this "productive failure" (Fisher & Frey, 2010) because these errors guide the type of instruction the student needs. Rodgers (2004/05) also notes that these errors must be balanced, because too few errors suggests that the task is too easy and scaffolds are not necessary (and thus the student is not working in the zone of proximal development), and too many errors can be "counterproductive to the learning process, because the student's engagement and contribution to the problem solving would likely diminish" (p. 526). In addition to the recognition that errors are important, Rodgers's data suggest that support must be modulated to be effective. As we have noted, this is consistent with the "instructional contingency" recommendations made by Wood and Wood (1996, p. 7). But Rodgers's data reflect real-time teaching, and she recognizes the difficulty in making split-second decisions about which actions to take, from modeling to demonstrating to questioning to prompting to cueing. The teachers in her study were able to make these decisions in part because they had developed a level of expertise that allowed them to recognize struggles and draw from a host of actions that they theorized would help. Perhaps even more important, as part of modulating support, Rodgers noted that the teachers had to make "decisions about what to attend to and what to ignore" (2004/05, p. 526). Again, this is a critical aspect of scaffolding student success and why it's hard to do. Parenthetically, it's also why it's hard for computers to provide expert guided instruction. It's simply very difficult to decide what to notice and then know what just-right thing to say or do to ensure that the student does cognitive work. Intentionality: The task has a clear overall purpose driving any separate activity that may contribute to the whole. Appropriateness: Instructional tasks pose problems that can be solved with help but which students could not successfully complete on their own. Structure: Modeling and questioning activities are structured around a model of appropriate approaches to the task and lead to a natural sequence of thought and language. Collaboration: The teacher's response to student work recasts and expands upon the students' efforts without rejecting what they have accomplished on their own. The teacher's primary role is collaborative rather than evaluative. These five guidelines, although useful, could be a description of good teaching in general. 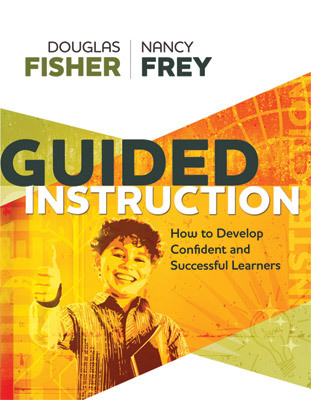 Of course, having these guidelines in mind can help us as we plan instruction for students and pay attention to how they respond to that instruction. Pre-engage the student and the curriculum. The teacher considers curriculum goals and the students' needs to select appropriate tasks. Actively diagnose students' needs and understandings. The teacher must be knowledgeable of content and sensitive to the students (e.g., aware of the students' background knowledge and misconceptions) to determine if they are making progress. Provide tailored assistance. This may include cueing or prompting, questioning, modeling, telling, or discussing. The teacher uses these techniques as warranted and adjusts them to meet the students' needs. Give feedback. To help students learn to monitor their own progress, the teacher can summarize current progress and explicitly note behaviors that contribute to each student's success. Puntambekar and Hübscher (2005) took a different tack in their analysis of the key features of instructional scaffolds. They analyzed the key features as a theoretical construct and identified four features of scaffolds. These features shape our thinking about guided instruction, regardless of whether it is used for whole-class instruction, small-group teaching, or individualized tutoring. Intersubjectivity. The first component necessary for instructional scaffolds to be effective involves the joint ownership of the task between the student(s) and teacher. This requires that the task be defined and redefined by the student(s) and teacher such that the student(s) begin to understand the task from the perspective of the more knowledgeable other. As Wood and colleagues (1976) noted, this involves "making it worthwhile for the learner to risk the next step" (p. 98). Dialogic and interactive. A third feature of learning scaffolds relates to the conversation that the student(s) and teacher have as part of the learning situation. This is not a time for a monologue, but rather a dialogue in which the teacher monitors student understanding and progress. It requires a fairly sophisticated feedback system in which the teacher is regularly checking for understanding and collecting assessment information. Fading. The final theoretical feature requires that the teacher fade the support provided to the learner(s). In Vygotskian terms, this occurs when the learner has reached internalization. Vygotsky (1978) hypothesized that cognition first occurs between people (interpsychological) before moving to intrapsychological (within one's own self). Without fading, this process of internalization cannot happen; students become "prompt-dependent," not independent. In educational terminology, we think of this as reaching automaticity (LaBerge & Samuels, 1974), which we have already discussed in terms of freeing working memory to focus on understanding. Again, we find these guidelines helpful in planning good instruction, but they're still fairly general. Here's another general idea worth remembering: the intent of the scaffold, or guided instruction, is to create situations that build students' knowledge so that they can apply, evaluate, and create—those elusive critical thinking skills first described by Benjamin Bloom in 1956 and updated by Anderson and Krathwohl in 2001 to reflect the kinds of learning we think about today (see Figure 1.1). These challenges can be overcome. Just listen in as Ms. Conroy interacts with her class. They have been examining cell structure, starting with building background knowledge from the website "How Stuff Works" (http://science.howstuffworks.com/cellular-microscopic-biology/cell.htm). She shows them the video about blood cells from the website and shares her thinking aloud with them. As part of her modeling, she makes connections between the information about red blood cells and the plant and animal cells they have already studied. She also asks herself questions and records these questions for later investigation. Following her modeling, Ms. Conroy uses whole-class guided instruction to determine students' level of understanding and readiness for the lab. She starts by asking them to draw a bacterial cell of their choice and to label the internal structures accordingly. They take out their dry-erase boards and get to work. Bradley chooses to draw the E. coli bacterium and has labeled the cell membrane, cytoplasm, flagella, DNA, and mitochondria. Noticing his error (bacteria do not have mitochondria), Ms. Conroy reviews the work of a few other students to see if they have added structures that do not belong. Like several other students, Chelsea has incorrectly included Golgi bodies in her Streptococcus pneumoniae cell. Ms. Conroy interrupts the class to say, "Remember, these are bacteria. They're more basic than human cells. Check your work." Several students look at their dry-erase boards and remove incorrect structures. Bradley does not, so Ms. Conroy says to him, "Think about each structure you've labeled and if it is appropriate for a bacterial cell." Bradley doesn't change anything on his board, so Ms. Conroy says, "I know that E. coli, as a bacteria, has a membrane. That's a common feature, as cells need a structure to contain their contents. And cells carry DNA. Well done. Ah, yes, and you have the flagella, a telltale sign of bacteria. Not all bacteria have them, but they're pretty common. What about the other structures you've labeled?" At this point, Bradley recognizes his error and erases mitochondria. While doing so, he says to Ms. Conroy, "You never just tell us the answer; you make us think for ourselves." And there it is—the interaction that changed Bradley's understanding of cellular structure. Of course, it won't always happen this fast. But when we're careful and we pay attention to students and their developing understanding, saying or doing the just-right thing will ensure that they do the cognitive work, not the teacher. After all, we've completed our K–12 schooling; it's time for our students to do so. The remainder of this book focuses on specific tools that you can use to guide students to greater levels of understanding. Taken together, these teacher moves, from questioning to checking for understanding to prompting, cueing, explaining, and modeling, provide a structure to realize the vision Vygotsky had for education in which students become themselves through their interactions with members of the learning community.